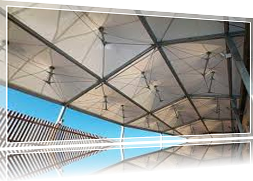 Tensile shades and roofing membranes made of polytetrafluoroethylene fabrics (PTFE, Teflon) have become increasingly popular being incorporated into some of the world’s extraordinary architectural designs. PTFE fabric, besides to be UV resistant and not combustible, possess outstanding features such as temperature and chemical resistance as well as dimensional stability and robustness. Diverse types of PTFE are available on the market, also known as glass fabric and silicone coated glass fabrics. None of them could be welded by means of high frequency. Benefits that can be obtained using the high quality (and rather expensive) PTFE materials in tensile architecture are conditioned with employment of technically advanced equipment, such as special PTFE welding machines. That is reason why Balacchi HF has developed the series of machines for welding of PTFE & silicone coated material. The design of BR10PTFE welding machines involves the big C frame that gives wide space for material handling. The machine is produced as single-rod (just for heating) or as “double-head” system that enables the welding of PTFE sheets with subsequent cooling of material just underwent the high-temperature sealing. The range offered is widespread: from long welding machine (1000-1800mm) to small welding irons, known as popular hand welding tools. The important feature of Balacchi’s PTFE welders is the short-term sealing process that is enabled applying electronically controlled high temperature (up to 400oC) accompanied with pneumatic pressure. The operating pressure for the welding bar cylinders is also electronically controlled and limited. Its firm steel construction is very rigid, resisting to deflection from the pressure that is generated when the pneumatics bring into contact the top and corresponding bottom welding bar (rod). The low profile allows easy loading of heavy PTFE fabrics while press/welding system permitting strong and continuous joins along the entire welding surface. Balacchi’s PTFE welding machine is easy to use, reliable and ergonomically friendly. Balacchi HF BR10PTFE can be easily moved thanks to strong wheels, which also facilitate the manipulation of the material during the welding process. Pneumatic cylinders lift up to 200mm that allow large-dimension roles to be used. Central control panel is intuitive and easy to use while the machine can be operated with hand or foot control. Bottom and top welding bars are separately controlled by microprocessors that permits precise temperature distribution along the both welding surfaces with maximum variation of ±1%. The BR10 PTFE welders are available in various size and for various purposes. This machine operates in two-step positioning mode that enables the precise placing of material and straight welding seam effectively avoiding the accidental seaming. Welding rod is usually 100x1000mm, but it could be upgraded according to client’s demands. Special engraved electrodes are also available.